The weather report said the snow has never been so severe in Britain in the last eighteen years. The Artic winds coming from Russia is the main cause for all these chaos and they are likely to last for few more days. All the motorways are jammed (and at some places there was 50 miles of congestion! ), some of them are closed, most of the schools are closed and even public transport system is shut down in some parts of the country!!! While washing the plates after dinner on Sunday evening I saw little dusting of snow on our garden shed and thought to myself it is one of those days where it snows everywhere except in our neck of woods. But soon small flakes of snow continued to fall and within half an hour there was an inch of snow covering the grass, trees and hedges. I was amazed to see the steady flow of snow flakes even when I went to bed and overjoyed when I saw thick coat of snow covered everything and turning gloomy grey scenes into white wonderland. It was the first time I had seen this much of snow in my neck of woods. Hell, 12 inches of snow is something that is very unusual in this county. Met office is continuing to advice drives not to venture out unless it is essential and requested to take extreme care while driving. So while Krish is loading few bars of chocolates, water, and shovel in car’s boot I am snuggling under my favourite blanket with a wonderful book and flask of strong filter coffee and munchies ;) Yep, my holidays just coincided with the snow fall and boy, am I enjoying it or what? I did enjoy running around in our backyard and building snowman for good two hours. But it’s not much fun when your palms turn from deep red to purple and your nose start to leak! And you need a good target to throw all those big snow balls and my target was away on training and will be coming back home late in the evening. That’s when I decided to take break and cook my lunch. Usually I opt for frozen food, takeaways or canned soups when I am alone at home. I don’t feel motivated or need to cook for myself. But good two hours of playing in cold weather left me wanting to eat something warm, something special, and something comforting. All I had in refrigerator was big cauliflower and a pack of multi-coloured bell peppers. People who know me quite well also know my love for stinking flower, I mean cauliflower. So there is no surprise as why I reached out for a bag of peppers. Since kneading and rolling the dough was out of question after kind of kneading the snow balls so curry was stroke off from the list. Unbelievably we were out of usual whole meal pack of bread, so the soup was out of question. I was left with choosing between stew and salad and you don’t have to be a Sherlock Holms to find out what I opted for!!! Yup, I had Capsicum Stew for lunch served with a bowl of White Rice. While the rice was cooking in microwave, I went through a recipe book called 100 Vegetarian Curries by Mallika Badrinath. This is one of 4 books my mother bought for me when I left home as a new bride and it’s the same book referred when I couldn’t call my mother during initial days of my ‘hit and miss’ cooking days. This is a thin book which will fit well in your palms and has no glossy pictures to drool on. But what it has is collection of hundred different curries with outstanding results. I have had tried many recipes from this book and most of them have come out finger licking delicious. So all new brides out there, I would highly recommend this book if you have just started to cook and want to impress your family members with something exciting. Mrs. Mallika Badrinath uses common, easily available ingredients in her recipes but her cooking style turns the final product to something exciting and exquisite. And the best example is this Capsicum Stew where she uses few spices and coconut milk that is very common ingredients in many households in south India, yet the end result is something beyond anyone’s expectation. Sweet and peppery capsicums cooked to tender in creamy goodness of coconut milk and roasted spice powder will surely make your head spin with different flavours dancing on your mouth and leave you feeling content. Don’t believe me? Well, then you simply have to try this dish and see if I am telling the truth or not! Heat a pan and dry roast poppy seeds till they turn light golden, about 45 seconds. Transfer the roasted poppy seeds to coffee grinder or mixer jar. In the same pan heat oil and roast all the ingredients till lentils turn golden brown and aromatic. Let the roasted spices and lentils cool completely before you mix them with poppy seeds. Grind these roasted lentils and spices to fine powder and keep aside till needed. Heat oil in a pan and add mustard seeds to it. When mustard starts to pop and splutter, add cloves, cardamoms, curry leaves and hing. Sauté for a minute till the spices are aromatic. Now add peppers and cook them on medium heat till their skin is wilted, about 3-4 mins. Mix in spice powder, turmeric powder, jaggery, tamarind extract and salt to taste. Now add 1/3rd of Coconut milk (thin milk if using freshly made coconut milk) and mix well. Cover and cook for 2-3 mins. 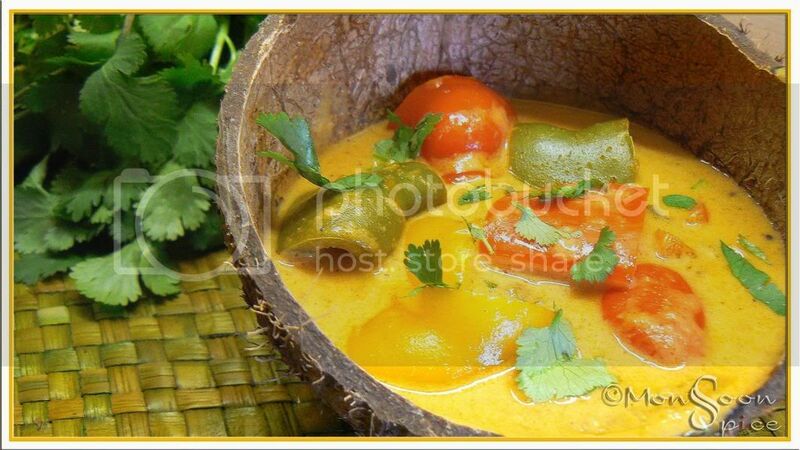 Mix in the 2nd extract or 1/3rd of coconut milk and cook uncovered in low heat and bring it to gentle boil, about 5 mins. Now add the tick coconut milk (or remaining 1/3rd) and bring the gravy to gentle boil, about 2-3 mins. At this stage make sure that the peppers are cooked well and they still retain their crunch. Turn off the gas and mix in finely chopped coriander leaves. Cover and let it sit for 5 mins for all the flavours to blend well. Serve it hot with steam cooked rice and enjoy. Hi Sia, that stew looks inviting. How was your vacation ? Hope you had a great time in India. It's fun to have some snow once in a while although it's inconvenient. We had a 1/2 " snow today, all melted away by afternoon. That is a great colorful stew!!! Be warm Sia. Here we are having very low temperatures for two months now and I am frustrated with it. Your stew looks so comforting. I loveee coconut based dishes. That's a riot of colours, and I love the coconut 'bowl', awesome Sia! The shellful of capsicum stew looking very wonderful Sia. 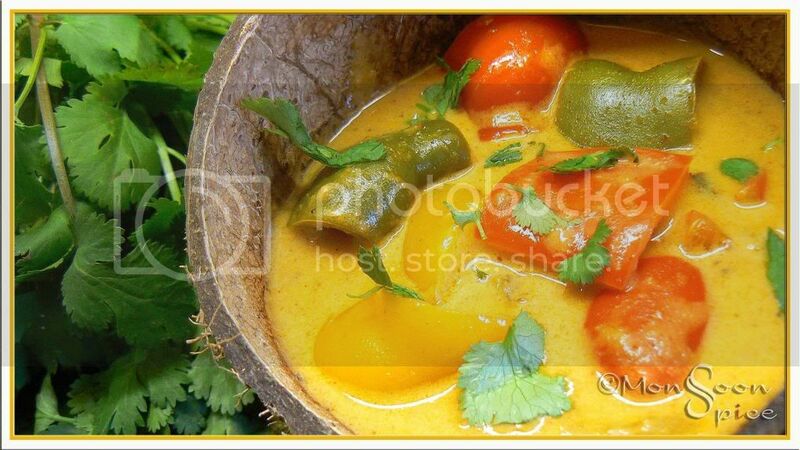 I never used coconut milk in my cooking..this looks so tempting I can imagine the taste. Nice lunch ! delicious!!!! pictures are lovely, as usual... :) I've tried stew w/ potatoes, but never w/ peppers... sounds like a welcome change!! btw, what camera did you say you use?? really sorry to keep bothering you with the same Q.... I searched my entire mailbox, but I guess Ive deleted the mail in which you had mentioned the model :(. Nice recipe.. Very informative,Hey, great post. Really great tips for beginners,Thanks...Very informative website with important details. Wowo ilove the presentation in the coconut shell, looks so beautiful. Ofcourse i love the stew too. I am glad you enjoyed some time off on a snowy day......isn't it fun?? I usually sit by the fireplace and watch a good movie with the kids. That stew looks awesome in that coconut shell....Stay Warm! You have a lovely blog, awesome snaps. And the stew looks yummy! Heard a lot about snow and snow and snow around in UK.But you seems to making most of it.Snow man,stew and all..way to go lady...enjoy ! 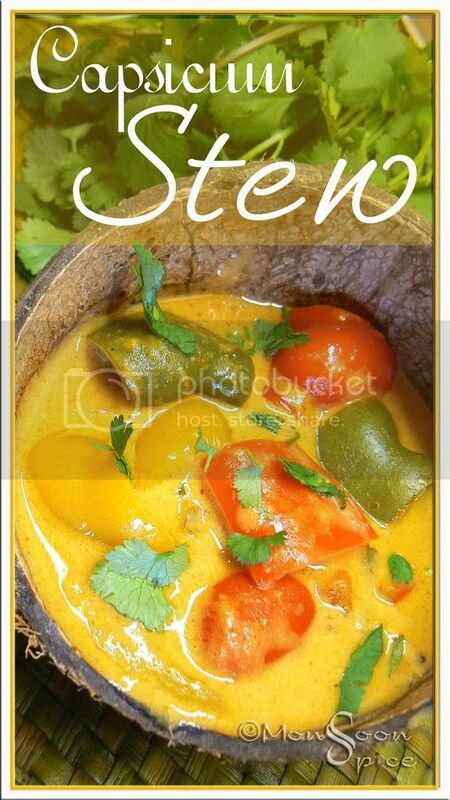 wow the stew looks tempting along with the presentation..very colourful, bright , creamy looking stew.. I love the colour of the dish, loooks delicious..Great presentation!! Keep Warm and bisi-bisi oota madi! The stew looks yum yum! My tummy started rumbling at the sight of the stew!! I do have the cookbook, all her recipes are delicous. With the snow storm, evryone had a break I guess .... Once in a while it is ok to see some white blanket. Love the capsic stew is very inviting! I read that public transportation was affected.Thats bad. That sounds immensely delicous. I feel like making a snowman with my kids.. only we do not get ANY snow here. Darn!! Perfect presentation. I'll have to make this. My family is going to love this! stew looks delish. loved the presentation of serving it in the coconut shell. nice. by the way i love delhi6 songs too. Love the coconut bowl, Sup! Pix are beautiful. Glad you are enjoying the snow. I made this y'day for dinner and loved it..thanks for sharing..lovely pictures..
Capsicum stew is something new to me. Looks flavourful and yum. Have a happy time playing in snow and be safe while driving . this is very nice ...new to me..
Nice warm stew for the icy weather. I tried it for lunch today with white rice. 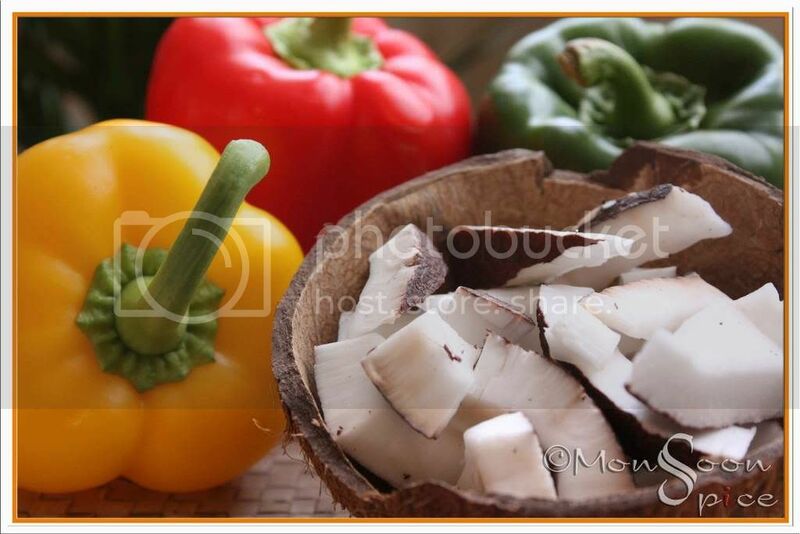 What a beautiful click........looks good in the coconut shell. Hi Sia, Was looking for a stew recipe and came here..and guess what 100 veg curries by Mallika badrinath was one of the books my mom gave me too when I left home as a young bride:))))what a coincidence!!! beautiful narration. I could picture you doing all that you mentioned in your post. The peppers look gorgeous and curry seems wonderful.